Being up close to a wind turbine isn’t an everyday experience for most people. The size of these machines is awe inspiring and it’s bound to prompt some interesting conversations! 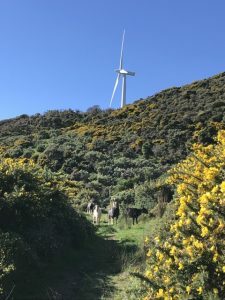 West Winds is home to 62 wind turbines that make use of Wellington’s famous wind to potentially power all the homes in Wellington. 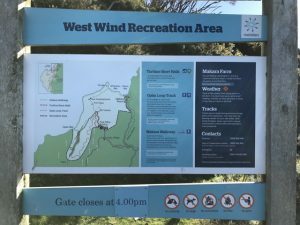 The wind farm is situated on a working farm that incorporates native bush, pine forest, rolling hills and coastline and there are 3 well marked tracks for walkers and experienced cyclists to explore. The shortest walk, which is also the start of the other 2 walks, goes out to the only wind turbine that the public can go right up to, known as B2. This is roughly a 20 minute return walk to/from the car park and is quite exposed on a windy day. There are information boards about how wind turbines work but if you want to read up on this before you go, have a look here! One of the longer walks goes steeply down to Opau Bay which is subject to big swells as shown by the huge amount of driftwood that stacks up inland. 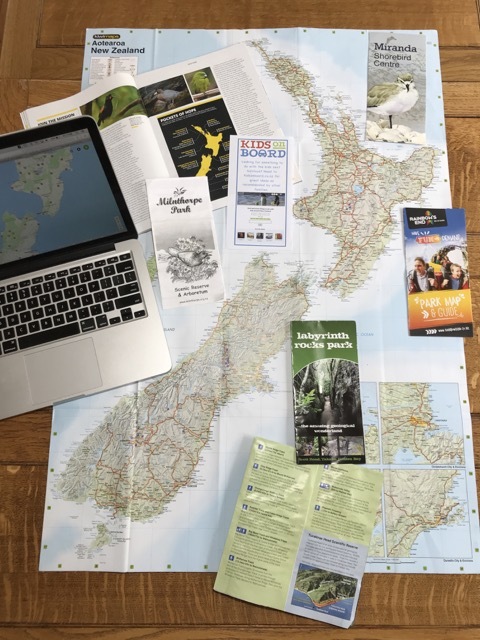 From this bay you can either walk along the coast to Makara or loop back up past wetlands, through manuka and karaka groves and a pine forest before coming out at the B2 turbine again (roughly 5.5km and at least 2 hours to walk). In places this walk is very muddy and don’t be surprised to come across wild goats! It is worth noting that this loop walk is best done as described above so that the very steep section is done downhill rather than uphill. The majority of this walk is surprisingly sheltered from the wind. The third walk in this area again starts off going to the B2 turbine but then continues towards the coast via an old World War 2 fort, gun emplacements and a Pa site. There are info boards along the way to fill you in on the history of what you’re seeing. From here you could return to the start or continue down to explore the rock pools around Wharehou Bay or for a really long walk (at least 3 hours), head in the other direction to Opau Bay to return via the wetlands and forests of the loop walk. It’s worth noting that walking along the coast when the tide is in, wouldn’t be easy. The beach is covered in rocks rather than sand and has a very steep drop off. You’ll need to be very mindful of children. Whether you walk for 20 minutes or several hours the views are amazing. In one direction there are wind turbines and in the other, on a clear day, the South Island looks incredibly close. It’s very peaceful, and while you will pass other walkers, it’ll be a lot less than on other more well known routes. TOP TIPS: Make sure you take plenty to eat and drink as there’s nothing available to buy in the recreation area. Also, worth noting is that dogs are NOT allowed at anytime and the whole area is closed to the public during lambing season in August & September. Address: Opau Road, Makara. There’s a carpark at the road end and a couple of toilets at the start of the track near the map. Open: daily April, May, June & July 9am – 4pm and 1st October – March 9am – 6pm. Closed for lambing all of August & September.